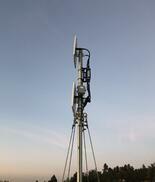 Wireless mesh networks are reliable and offer great redundancy. If one wireless mesh node can no longer operate, all the other wireless mesh nodes can still communicate with each other, directly or through one or more intermediate outdoor wireless bridge links. Each wireless Ethernet bridge link can send and receive messages in a wireless mesh network. Each link also functions as a router and can relay messages for its neighbors. Through the relaying process, a packet of wireless data will find its way to its destination, passing through intermediate links with reliable communication. Mesh wireless backhaul networks can be configured in a star topology or be made up of multiple types of configuration topologies. Wireless mesh networks can be configured for both outdoor and indoor applications. Outdoor wireless mesh networks are great in urban settings where there are a lot of obstructions (e.g. buildings) to provide a quality wireless backhaul for mobile connectivity, wireless video surveillance, or Wi-Fi. Most wireless mesh networking devices operate in the 2.4GHz, 4.9GHz, 5.3GHz, 5.4GHz, or 5.8GHz unlicensed wireless frequency bands. The reach of a wireless mesh network can be extend, greater redundancy can be achieved, and improved reliability of the outdoor wireless bridge network simply by adding more wireless backhaul links. Because a wireless mesh network's operation doesn't depend on a central control point, utilizing multiple links provide a reliable mobile network. Wireless mesh networks are extremely scalable and can handle hundreds of wireless mesh nodes on wireless backhaul network. Today many wireless mesh nodes can be configured for wireless point to point backhaul, set up as a point to multipoint wireless system, or be a true wireless mesh node. By using the same wireless mesh device for a wireless backhaul system it becomes easy and cost effective to maintain spare wireless equipment. Need More Information or a Quote for Wireless Mesh?